› Author AffiliationsThis work was financially supported by ACT-C (JPMJCR12YO) from JST, and KAKENHI (17H03025, 17K08384, and JP16H01043 in ­Precisely Designed Catalysts with Customized Scaffolding) from JSPS and MEXT. † Y. Ota and Z. Li contributed equally. 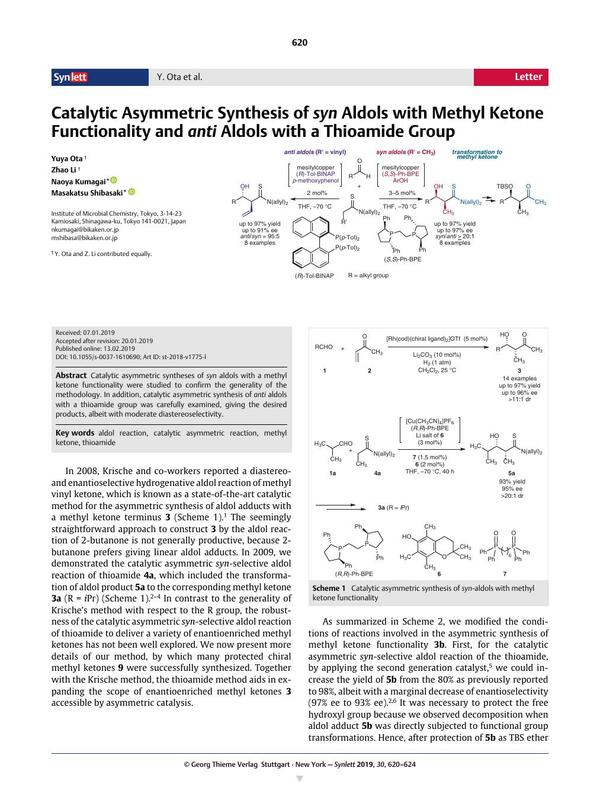 Catalytic asymmetric syntheses of syn aldols with a methyl ketone functionality were studied to confirm the generality of the methodology. In addition, catalytic asymmetric synthesis of anti aldols with a thioamide group was carefully examined, giving the desired products, albeit with moderate diastereoselectivity. Supporting information for this article is available online at https://doi.org/10.1055/s-0037-1610690. 6 General Procedure for the syn-Selective Catalytic Asymmetric Aldol Reaction of Thioamide 5 A flame-dried test tube (20 mL) equipped with a magnetic stirring bar and a three-way glass stopcock was charged with (S,S)-Ph-BPE (6.1 mg, 0.012 mmol), 2,2,5,7,8-pentamethylchromanol (6, 2.6 mg, 0.012 mmol), and mesitylcopper (2.2 mg, 0.012 mmol) in a dry box. To the mixture was added dry THF (240 μL, 0.05 M) with a syringe at r.t. After 5 min of stirring at the same temperature, a yellow-green solution of (S,S)-Ph-BPE/mesitylcopper/6 was obtained, which was used within 15 min. A flame-dried test tube (20 mL) was charged with N,N-diallylthiopropionamide (4a, 1.2 equiv), dry THF (0.2 M), 1 (1.0 equiv). The reaction mixture was cooled to –70 °C. To the resulting cooled solution was added dropwise previously prepared (S,S)-Ph-BPE/mesitylcopper/6 solution (3 mol%) to run the reaction. After a certain time at the same temperature, the precooled solution of acetic acid in THF (0.1 M in THF, 1 mL), then saturated NH4Cl aq. were added to quench the reaction. The aqueous layer was extracted with ethyl acetate. The combined organic layers were washed with brine and dried with Na2SO4. The filtrate was concentrated under reduced pressure. The residual product was purified by silica gel column chromatography (n-hexane/EtOAc) to give 5. Compound 5c: Yield 90%; colorless oil; 1H NMR (400 MHz, CDCl3): δ = 5.94–5.74 (m, 2 H), 5.34–5.10 (m, 4 H), 4.92 (dd, J = 14.8, 5.4 Hz, 1 H), 4.66 (s, 1 H), 4.36–4.04 (m, 3 H), 3.83–3.77 (m, 1 H), 2.96–2.87 (m, 1 H), 2.21 (t, J = 7.0 Hz, 2 H), 1.65–1.20 (m, 11 H), 0.14 (s, 9 H); 13C NMR (100 MHz, CDCl3): δ = 211.0, 131.2, 130.7, 118.8, 117.9, 107.7, 84.5, 72.7, 55.6, 52.9, 46.3, 35.0, 28.9, 28.7, 25.8, 20.0, 14.1, 0.3; IR (NaCl): 3359, 2172, 1448, 1410, 1333 cm–1; HRMS (ESI): m/z calcd for C20H35NONaSSi [M + Na]+: 388.2101; found: 388.2100; [α]D 23 +82.9 (c 1.10, CHCl3, 97% ee); HPLC analysis: Daicel ­CHIRALCEL OZ-H, Ø 0.46 cm x 25 cm, n-hexane/iPrOH = 40:1, flow rate = 1.0 mL/min, detection at 254 nm, tR = 7.6 min (minor), 14.9 min (major). 7 General Procedure for the Preparation of TBS-Protected Aldols 8 A flame-dried test tube (20 mL) was charged with aldol adduct 5 (1.0 equiv), azeotropically dried with toluene (60 °C, 10 min for two times), and then dried under vacuum for 1 h. Afterwards, CH2Cl2 (0.1 M), 2,6-lutidine (2.0 equiv), and TBSOTf (1.5 equiv) were added successively by using well-dried syringes and needles at 0 °C, and then the resulting mixture was allowed to warm up to r.t. After stirring over night at r.t., saturated NH4Cl aq. (1 mL) was added to the reaction mixture. The mixture was extracted with EtOAc. The combined organic layers were washed with brine and dried with Na2SO4. The filtrate was concentrated under reduced pressure and the residual product was purified by silica gel column chromatography (n-hexane/EtOAc) to give 8. Compound 8b: Yield: 88%; colorless oil; 1H NMR (400 MHz, CDCl3): δ = 7.28–7.24 (m, 2 H), 7.18–7.11 (m, 3 H), 5.93–5.74 (m, 2 H), 5.28–5.16 (m, 4 H), 4.77 (dd, J = 14.7, 5.7 Hz, 1 H), 4.54 (dd, J = 14.7, 5.7 Hz, 1 H), 4.39–4.34 (m, 1 H), 4.31 (dd, J = 17.1, 5.0 Hz, 1 H), 4.14 (dd, J = 17.1, 5.0 Hz, 1 H), 3.09–3.02 (m, 1 H), 2.73–2.58 (m, 2 H), 1.89–1.73 (m, 2 H), 1.30 (d, J = 6.6 Hz, 3 H), 0.96 (s, 9 H), 0.15 (s, 3 H), 0.14 (s, 3 H); 13C NMR (100 MHz, CDCl3): δ = 208.9, 142.7, 131.4, 131.0, 128.3, 128.2, 125.7, 118.4, 118.3, 55.2, 52.6, 48.3, 37.2, 31.1, 26.1, 20.6, 18.3, –0.0, –3.8, –4.0; IR (NaCl): 3084, 3063, 3025, 2954, 2929, 2894, 2856, 2360, 2341, 1717, 1644 cm–1; HRMS (ESI): m/z calcd for C24H39NOSSiNa [M + Na]+: 440.2412; found: 440.2414; [α]D 23 +6.0 (c 2.23, CHCl3). 8 General Procedure for the Preparation of syn Aldols with Methyl Ketone Functionality 9 A flame-dried test tube (20 mL) was charged with TBS-­protected aldols 8 (1.0 equiv), azeotropically dried with toluene (60 °C, 10 min for two times), and then dried under vacuum for 1 h. Afterwards, Na2CO3 (1.5 equiv, freshly dried under vacuum by heating), diethyl ether (0.2 M), and MeOTf (1.5 equiv) was added at r.t. After stirring the reaction mixture at the same temperature for 7 h, the mixture was cooled to –70 °C, and then methyl lithium (1.03 M in Et2O, 3.0 equiv) was added in one portion. After stirring the reaction mixture at the same temperature for 1 h, acidic silica gel (250 g/mol) was added and then stirred for 30 min at the same temperature. The resulting mixture was warmed up to r.t. and then filtered through a short pad of celite. The precipitate was washed with EtOAc. After removal of the volatiles under reduced pressure, the resulting residue was purified by silica gel column chromatography (EtOAc/n-hexane) to give 9. Compound 9b: Yield: 93%; colorless oil; 1H NMR (400 MHz, CDCl3): δ = 7.30–7.26 (m, 2 H), 7.20–7.15 (m, 3 H), 3.99 (dd, J = 11.1, 5.3 Hz, 1 H), 2.74–2.54 (m, 3 H), 2.17 (s, 3 H), 1.85–1.64 (m, 2 H), 1.09 (d, J = 7.0 Hz, 3 H), 0.91 (s, 9 H), 0.09 (s, 3 H), 0.06 (s, 3 H); 13C NMR (100 MHz, CDCl3): δ = 211.3, 141.9, 128.4, 128.3, 125.9, 77.2, 73.2, 51.9, 36.5, 31.8, 30.0, 25.9, 18.1, 11.8, –0.0, –4.3, –4.4; IR (NaCl): 3086, 3063, 3027, 2954, 2930, 2886, 2857, 2360, 2341, 1712 cm–1; HRMS (ESI): m/z calcd for C19H32O2SiNa [M + Na]+: 343.2064; found: 343.2067; [α]D 23 +13.3 (c 1.55, CHCl3). 9 General Procedure for the Preparation of TBS-Deprotected Methyl Ketone 3b A flame-dried test tube (20 mL) equipped with a magnetic stirring bar and a three-way glass stopcock was charged with (3S,4R)-4-[(tert-butyldimethylsilyl)oxy]-3-methyl-6-phenylhexan-2-one (9b) (19.6 mg, 0.061 mmol, 1.0 equiv) and AcOH (0.5 M in THF, 0.27 mL, 0.13 mmol, 2.2 equiv). To this mixture was added TBAF (1.0 M in THF, 0.27 mL, 0.27 mmol, 4.4 equiv) and it was stirred for 20 h at r.t. The resulting mixture was concentrated under reduced pressure. The residual product was purified by silica gel column chromatography (n-hexane/EtOAc) and isolated as a colorless oil (12.2 mg, 0.059 mmol, 97%); 1H NMR (400 MHz, CDCl3): δ = 7.30–7.26 (m, 2 H), 7.21–7.17 (m, 3 H), 3.99–3.95 (m, 1 H), 2.88–2.81 (m, 1 H), 2.69–2.62 (m, 2 H), 2.56 (ddd, J = 14.6, 7.3, 2.9 Hz, 1 H), 2.18 (s, 3 H), 1.89–1.79 (m, 1 H), 1.65–1.56 (m, 1 H), 1.17 (d, J = 7.3 Hz, 3 H); 13C NMR (100 MHz, CDCl3): δ = 213.9, 141.8, 128.5, 128.4, 125.9, 70.1, 50.9, 35.7, 32.3, 29.1, 9.8; IR (NaCl): 3449, 3084, 3062, 3026, 2932, 2862, 1704, 1603 cm–1; HRMS (ESI): m/z calcd. for C13H18O2Na [M + Na]+: 229.1199; found: 229.1195; [α]D 24 –19.8 (c 0.33, CHCl3). 10 Reactions of 1c and 1d did not afford 9c and 9d, respectively, by Krische’s method. 13 General Procedure for the anti-Selective Catalytic Asymmetric Aldol Reaction of Thioamide 10 A flame-dried test tube (20 mL) equipped with a magnetic stirring bar and a three-way glass stopcock was charged with (R)-Tol-BINAP (8.1 mg, 0.012 mmol, 2 mol%), 4-methoxyphenol (1.5 mg, 0.012 mmol, 2 mol%), and mesitylcopper (2.2 mg, 0.012 mmol, 2 mol%) in a glove box. To this mixture was added THF (0.4 mL) with a syringe at r.t. After 2 min of stirring at the same temperature, a yellow solution of (R)-Tol-BINAP/mesitylcopper/4-methoxyphenol was obtained, which was used within 15 min. A flame-dried test tube (20 mL) was charged with N,N-diallylbut-3-enethioamide (4b) (130 mg, 0.718 mmol, 1.2 equiv), 3-phenylpropanal (1b) (80 mg, 0.6 mmol, 1.0 equiv), and dry THF (2.6 mL), and reaction mixture was cooled to –70 °C. To the resulting solution was added dropwise the (R)-Tol-BINAP/mesitylcopper/4-methoxyphenol solution within 1 min to run the reaction. After 6 h of stirring at –70 °C, a solution of acetic acid in THF (0.1 M/THF, 1 mL) and saturated NH4Cl aq. (1 mL) were added to the reaction mixture. The mixture was extracted with EtOAc. The combined organic layers were washed with brine and dried with Na2SO4. The filtrate was concentrated under reduced pressure. The chemical yield of the crude mixture was determined by 1H NMR spectroscopy with 3,4,5-trichloropyridine as an internal standard, and the diastereomeric ratio was also determined by 1H NMR spectroscopy of the crude mixture. The residual product was purified by silica gel column chromatography. Enantiomeric excess was determined by HPLC analysis. Racemic samples were obtained with the same procedure by using rac-BINAP as the ligand. Compound 10b: Yield 95%; pale yellow oil; 1H NMR (400 MHz, CDCl3): δ = 7.30–7.24 (m, 2 H), 7.22–7.14 (m, 3 H), 5.99–5.74 (m, 3 H), 5.35–5.10 (m, 6 H), 4.91 (ddd, J = 14.9, 5.1, 0.7 Hz, 1 H), 4.39–4.25 (m, 2 H), 4.20–4.06 (m, 2 H), 3.55–3.42 (m, 2 H), 2.98–2.88 (m, 1 H), 2.71–2.61 (m, 1 H), 2.02–1.89 (m, 1 H), 1.81–1.69 (m, 1 H); 13C NMR (100 MHz, CDCl3): δ = 204.2, 142.6, 137.0, 131.0, 130.7, 128.6, 128.5, 125.9, 118.6, 118.5, 73.9, 60.3, 55.7, 52.7, 35.6, 32.3; IR (NaCl): 3446, 3082, 1639, 1217, 1133 cm–1; HRMS (ESI): m/z calcd. for C19H25NOSNa [M + Na]+: 338.1549; found: 338.1549; [α]D 24 = +33.2 (c = 1.35, CHCl3); 72% ee determined by chiral HPLC analysis, HPLC: CHIRALCEL IE (Ø 0.46 cm x 25 cm), 2-propanol/n-hexane = 1:20, flow rate 0.5 mL/min, detection 254 nm, tR = 19.5 min (major), 22.5 min (minor).